The Brihaspati Infotech is India’s leading BigCommerce development company which facilitates the clients with quality BigCommerce design and development services. We have an in-house team of over 25+ specialist BigCommerce web developers who have delivered 1000's of successful e-commerce stores using standardized BigCommerce development practices over the years. 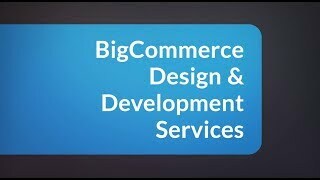 Our Expert BigCommerce Developers can help with: - Responsive BigCommerce theme creation - BigCommerce store redesign - Custom BigCommerce Apps development - Migration to and from BigCommerce - Integration with 3rd party API providers - BigCommerce Enterprise development services We follow an Agile development process keeping you informed on a daily basis and follow standardized BigCommerce development practices which emphasize continuous improvement while delivering the desired quality product. Under BigCommerce design and development services, our company provides clients with online store development and setup, customization, feature enhancement, BigCommerece theme development/customization, BigCommerce App development, 3rd party integration, eStore optimization and much more. The Brihaspati Infotech offers you cost-effective, professional, and reliable BigCommerce migration and integration services. Our services include Migration from other eCommerce platforms, Data Migration, Lossless shopping cart migration, Custom BigCommerce Enterprise solutions, and Custom 3rd party integrations. We offer you a team of experts that is well-practiced in providing you with responsive, pixel-perfect, and fast-loading HTML conversions. We accept PSD, Sketch, AI, and other possible file formats. Adding to this, we offer responsive BigCommerce theme designs from scratch and Theme development & customization.